Making a great architectural statement can be as simple and inexpensive as incorporating one of our distinctive vintage reclaimed barn wood mantels. We have antique weathered gray, milled, hand hewn, log, natural distressed and clear coated barn-wood mantels, each one unique and original. Lengths can range from 4 foot up, most of our mantels can be cut down to a desired length, we can find a fit for your fireplace mantel needs. 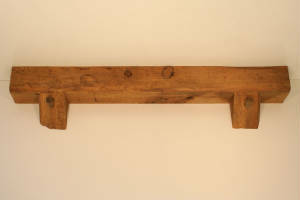 Vintage barn beams make a dramatic statement and they can work with just about any home decor from rustic to modern. Mantels can be purchased from our 207 N. Saginaw. Byron Michigan location, which is centrally located from Detroit, Lansing, Saginaw, Ann Arbor, Grand Rapids and Flint or shipped anywhere in the continental U.S. We accept cash, check, credit cards or PayPal for your convenience. We have more mantel material in stock than is listed here, fill out a product request form or give us a call to make an appointment to pick one out in person. If you would like a mantel shipped please fill out the Product Request form in detail and we will reply with a quote for that piece including shipping. All shipping costs vary depending on size, weight and destination. We have quickly become the unfinished barn wood mantel leader and will continue to work hard to get these shipped out to you and more inventory in stock as quickly as possible for your fireplace mantel needs. Thanks to all for your patronage. You can download a pdf on how to mount your mantel depending on your particle application at the bottom of this page. You can see what some of these pieces may look like installed on our Finished Projects Fireplace Mantels page. 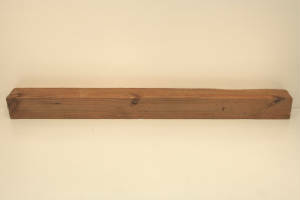 We have new stock of some premium mantels. The best ones go first so get yours before winter leaves us with slim pickings. We worked hard at graying this piece but there is still a clear area where some bark fell off and some uneven live edge. This is a good economical piece for that miscellaneous small fireplace or shelf. Should see it in person before purchase. This is really one of our better pieces right now. Slight gray with some brown showing through there is some nice dings and distressing on the face. 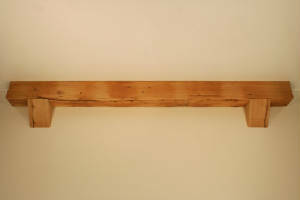 Perfect example of a reclaimed barn beam. There is one inconspicuous mortise on the back side. Sister to the one above only we are showing the naily side up which is facing down in the above picture and vise versa.This is really one of our better pieces right now. Slight gray with some brown showing through there is some nice dings and distressing on the face. Perfect example of a reclaimed barn beam. There is one inconspicuous mortise on the back side. Pretty light gray with some brown showing through on this hand hewn red pine beam. Unfortunately the camera does not capture the true gray colors. Slight gray distressed pine beam. This type of light distressing generally comes from a beam that runs across the width of a few barns right at railing height. Not sure what it is there for. Maybe to keep animals at bay but we can tell you the farm children sure love to play, walk, and balance on them leaving a nice amount of wear, nicks, and dings to give these the perfect character. We always spot these when we walk into a barn for mantel stock. As usual for this beams location there is several stud mortises you can see the edge of from the bottom or top depending on how you hang it. Also the bottom has an angle up towards the front. Slight gray distressed pine beam. This type of light distressing generally comes from a beam that runs across the width of a few barns right at railing height. Not sure what it is there for. Maybe to keep animals at bay but we can tell you the farm children sure love to play, walk, and balance on them leaving a nice amount of wear, nicks, and dings to give these the perfect character. We always spot these when we walk into a barn for mantel stock. As usual for this beams location there is several stud mortises you can see the edge of from the bottom or top depending on how you hang it. Also the bottom has an angle up towards the front and there is a bark edge on one of the back corner. This piece is hand hewn with a couple of rafter notches. We took a picture of it this way to show the notches but we would flip it for install and have them face down. They are not centered but could be with a few inches off one end. They grays are always hard to capture the color in a picture but I think we did pretty well here depending on your monitor. This is a beautiful piece with some smooth hewn on one side and perfect mild hand hewn marks on another. Has a medium dark patina and a mortise on the back side. Another beautiful piece with smooth hewn marks and a medium dark patina. Be aware though cameras and monitors do not show the true shade of this material. There are no mortises on this one. Nicely distressed pine beam. This type of light distressing generally comes from a beam that runs across the width of a few barns right at railing height. Not sure what it is there for. Maybe to keep animals at bay but we can tell you the farm children sure love to play, walk, and balance on them leaving a nice amount of wear, nicks, and dings to give these the perfect character. We always spot these when we walk into a barn for mantel stock. No mortises. We can cut this down for $20. Nicely hewn with good distressing and a darker patina. There is old gray paint in the character marks giving it an aged look. This is a real good piece to take home for the price. There is one mortise on the backside. We could cut this down to your desired length for $20. This piece has been hand hewn and mortised out to serve a purpose in the barn. Some folks like to see this character and craftsmanship and save some costs on there mantel at the same time. It does have a darker dirty patina so no mistaking this for an authentic turn of the century barn beam. A little aged and worn we have this one marked to sell. There is one mortise on the backside. Good for a second less formal fireplace like a bedroom, cottage or deck. Rustic look with original mortises and some tenons left in. We thought the pegged corbel look would go well with this piece. A beautiful rich patina this one comes with corbels and mounting hardware. This unique piece has a burnt live edge indicating it was involved in one of the Great Thumb Fires of 1871 or 1881. Read more about it here https://en.wikipedia.org/wiki/Thumb_fire. You would probably hang this one upside down from the picture but we wanted to show the burnt live edge off. Also, many folks don't realize they will be looking at the bottom of their mantel more than the top. There are many mortises to add to the authentic barn beam look. A light colored piece with really great distressing. 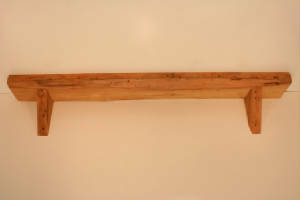 There is a slight curve as many old barn beams have making the cost on this piece a bargain. Smooth hewn with a distressed face with shapes stamped in it. Maple looks great with a clear coat to bring out the character and color. There are two pockets on the back side you can see the edge of. This piece is light and straight. Elm tends to be more coarse hewn with very noticeable adz marks. These have a nice light aged patina and a unique grain that both really pop with a clear coat. There is one mortise on the back side. This one does have a slight curve. Nice dimensions for a mantel with one mortise centered on the face there is some live edge on the bottom corner. Smooth hewn with the classic ash grain and a prtty good patina. The top side is naily. We took the picture upside down and generally most folks see the bottom of the mantel more than the top. This is a real nice smooth hewn mantel out of an ash. The bottom side in the picture is naily but we would face that up so you can admire the nice hewing when sitting in front of the fire. There are not mortises in this piece so the choice is up to you. Nice dimensions for a mantel with it being deeper that it is tall and we can cut it down to length for $20. Nice dimensions for a mantel and this piece could be cut down in length for $20. Many folks prefer the look of the white oak grain but the trade off is it is pretty heavy, This one has a mortise on corner sides so no way to hide them and the side 5.5" that has a mortise has an angle to it so not the best mounting side. But if you are good with the look of mortises you can pick this one up for a good price. Love this piece with a nice dirty gray color and hatched marks on the face. The rough sawn circle saw marks and naily corbels add the the look. Color is hard to get right in the photograph but you will not be disappointed in the look of this one in person. Comes with corbels and hanger bolts. Hard for us to come buy good gray mantel pieces. 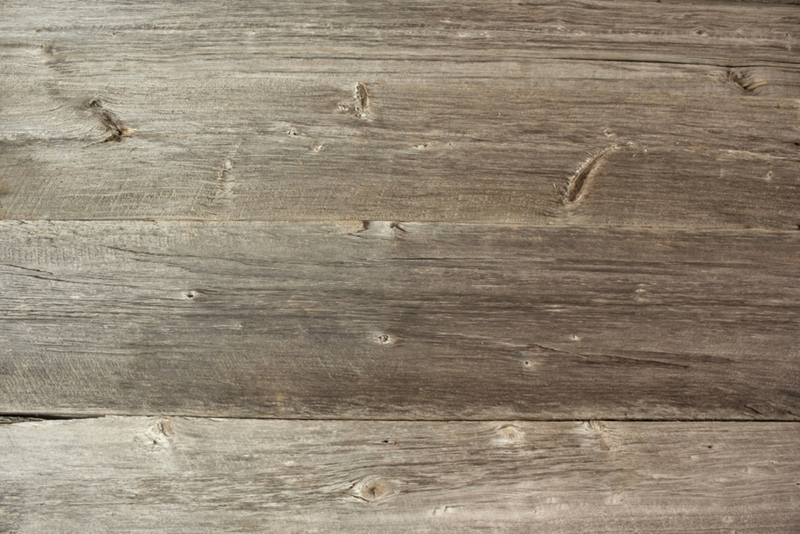 Many think all barn wood is gray but only the outside is gray. The inside is just 150 years of dirt and dust. This one came pretty gray so we did not have to leave and rotate it outside like we do on some others. Circle saw marks and a naily bottom it has plenty of character if you are looking for a weathered gray piece. Comes with corbels and hanger bolts. This style generally works best if you are capping of a standard height stone fireplace but did have someone buy the sister to this one to be thin enough to shape around an existing floor to ceiling stone chimney. We did have to rotate this one to try and even up the gray color. We generally never get them a even gray color so we have to leave the some sides out to face the sun and even up the color. It takes some time and rotation. This one has some interesting quilted grain and gray areas. Ash wood in general has a beautiful prominent grain as this one does and with a naily face and other character this one will make a nice top to any fireplace. Faint graying this one has a some very unique abstract wormy live edge for those that like things to be a little interesting and different, We matched up some live edge corbels for those that need a little more continuity. There is some quilting grain and a weird raised circle grown into the live edge we just had to keep and show off. Hope you like it as much as we did. You can see how this would look with a clear coat in the finished mantels section. Comes with matching corbels and hanger bolts. Perfect circle sawn piece of white oak with a naily face or you can use the non naily side as shown in the second picture if you like depending on the character you like. You can see how this would look with a clear coat in the finished mantels section. Comes with matching corbels and hanger bolts. Shelf style circle sawn white oak mantel with corbels and a faint gray color. You can see how this would look with a clear coat in the finished mantels section. Comes with matching corbels and hanger bolts. Very interesting wormy naily live edge with corbels that have a bit of live edge to match.Comes with matching corbels and hanger bolts. Douglas fir tends to get a deep rich red/brown patina that many find very attractive. There is some light ware on these together with the straight smooth surface and deep patina makes this a nice option for a slab style mantel or a display shelf. We Can cut this one down quick and touch up the end for a small fee if you need something shorter. Circle sawn elm with a big live edge bottom. Elm has a beautiful grain and keeps a lighter colored patina. We have found that this species after sanded can take stain better than most our other barn wood if you wanted it darker. A narrow rustic slab of white pine with a nice medium to light patina. Corbels and hanger bolts included for easy installation. A small rustic slab of old barn joist with a nice dark patina and iron nail bleeding holes. This one is real rustic. Thanks to are helper doing a great job sanding this one out it came out beautiful. We did a clear coat one of these and it came out so cool it sold right away before we could even get pictures of it. With prominent circle saw marks and a rough texture including large nail holes on the sides.This one is reversible if you like the naily edge in the second picture better. Perfect dimensions and color for a nice semi rustic fireplace. Folks always asking for dark colored pieces with no pockets that are deeper than they are tall. So here you go. Get it while we have it. All them factors do not come a long in the same beam very often. Showing the more rustic naily face but we have pictures of the more modest other side you cold face out if you are lame. Nice dimensions and dark color with good saw marks and clean lines. Great for a mid formal setting. Some minor respectable live edge. The back side has been cut to go against the wall. There is some light gray in with this brown color the camera did not pick up. Nice prominent circle saw marks with no mortises the back has a more brown naily side to it you may like better but either way you can't go wrong. We do have pictures of the back side too or you can get an idea from the matching beam below. A nice circle sawn beam with prominent saw marks and a naily face that we found more interesting but with no mortises you could face this anyway you want. The back side would look similar to the beam above but no noticeable graying. This one has a lot of nice aged dings and nicks and includes a handmade tethering ring showing years of use in the barn. We made some matching corbels that mount with bolts hidden by some old authentic barn pegs or trunnels. Trunnel or barn peg, (also known as a tree nail), is the wooden pegs used to hold the whole tendon and mortise barn beam structure together. 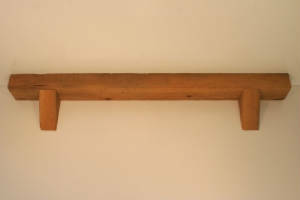 Learn more about barn pegs here; https://en.wikipedia.org/wiki/Treenail. Believe these to be birch but very hard to tell from popular, soft maple, and basswood. This has a light patina with saw mark accents. There is one mortise on the back side and a peg hole you can see from the top and bottom. We rarely get birch beams but they have a lighter patina with some light minerals streaks. This one has a nice live edge on the bottom front corner and good circle saw marks. There are no mortise but the back does have cracks from when the beam dried more than a hundred years ago. Most any beam will have some type of cracks called checking from when they originally dry from the outside in as the outside shrinks faster than the inside can. We could cut this down to your desired length for $20. We rarely get birch beams but they have a lighter patina with some light minerals streaks. This comes with corbels and hanger bolts. We could cut this down to your desired length for $20. This is not the best piece but the price reflects that. There is a mortise on the back side also.We could cut this down to your desired length for $20. A interesting circle sawn elm piece with two thru mortises for those who like to see that hand crafted character and that says this is a true turn of the century reclaimed barn beam. It is slightly weathered on the back side. We do have good pictures of all four sides of this one. A interesting wormy circle sawn elm piece with one mortise on the bottom side and some live edge. There are no mortises on this one but there is a weathered spot. Well distressed the back side is a little darker with many nail holes if you like that better. There are no mortises or pocket's in this one so options open. Some distressing some may like others may not. 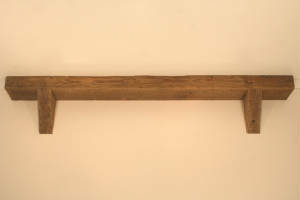 Light weight for easy install with good patina for that aged barn beam look. There is a pocket hole on the bottom side we do have a picture of. This one could be cut down to your desired length for $20. This came from an old warehouse joist so a little different than our normal barn beams. We get a lot of request for this size and generally do not get it in a barn beam. A very dark patina with some hi-lo dings. The cut end would definitely need a ouch up with a torch and it will match perfectly. This is a pretty heavy piece so it should set on something or be set in stone good. We have more of this material. What size do you need? This piece came out beautifully. Just perfect character, color, and grain. Really keep looking at it feeling we cannot charge enough so please come and get it before we change our mind on the cost. As usual the camera does not capture the true character, color, circle saw marks, or quilted grain areas. Three coats of polyurethane to last and protect for many years. Comes with matching corbels and anchor bolts. A really beautiful circle sawn live edge ash piece with matching corbels. Can't say enough about this one either. Beautiful grain, finish, color, distressing, live edge, and even some curly grain by the knots. This one will go very quickly. Another gorgeous piece. We had a very hard time deciding which sides looked best so we are calling it reversible and finished all sides good. The back has some live edge which originally was meant to go with the corbels from the mantel below but the naily side looked so cool we swapped corbels and the front. if the piece is still available below we will swap if you like better. There is also some nice quarter sawn rays, circle saw marks, and a perfect finish. This one will go very quickly also. Another gorgeous piece. We had a very hard time deciding which sides looked best so we are calling it reversible and finished all sides good. The back has less nail holes if desired as show in the second picture. This one has live edge corbels. There is also some nice quarter sawn rays, circle saw marks, and a perfect finish. Comes with mounting bolts. A nice live edge with nail holes on the front. Skim planed to leave some circle saw marks but still bring out the amazing grain on this piece. Must see to appreciate for we could not capture it on film. We did take a few close ups if you live in another state and can't come out to visit us in person. Three coats of polyurethane to last and protect for many years. Comes with matching corbels and anchor bolts. Black ash has a beautiful grain and is heavier and harder than most other ash and has a lot of the same characteristics as hickory. With some mineral deposits and a darker heartwood we skim planed and clear coated this one so you can see the pretty grain and color variations. The finish also brings out the skimmed saw marks and other character the planner leaves behind in a skim plane. Comes with matching corbels and anchor bolts. Nicely distressed with a multi color patina we love this piece. The top was sawn many years ago so it also has a nice patina to match. With a couple of small construction notches this mantel piece has a great look. This one has a lot of character on the log face with weathering nicks and dings and other wear. Nice natural colored patina and hewn on the other three sides. We have made corbels for this piece now. New picture to come if we don't sell it before then. We still need to finish this one up by cutting the back straight but if you have the capabilities to do it yourself you could get this beautiful piece at a much better price. Right now both sides are an option and have a beautiful patina with knots and hatchet marks. Nice light color variations. For your convenience you can click to download the pdf file on the left that most appropriately describes your mantel mount application. Or use a combination of a few to meet your installation needs. We do our best to give good installation instructions here but every application is different and should be performed by a skilled installer. 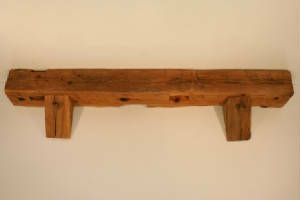 You can give us a call with any questions to help you mount your reclaimed barn wood mantel for years of enjoyment.